The UnPlugNPlay Ping Pong Table Barriers will define your court space by creating a perimeter for play. 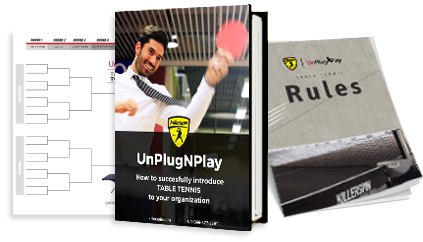 Killerspin is a leader in table tennis equipment and accessories. Tired of chasing balls around the room or across the patio? Our partitions will keep bouncing balls contained and protected from damage so you can focus on the game that you love. Perfect for home, office, bars, outdoors, patio and other open locations. They come branded with Killerspin logo on one side, but could be branded with a custom logo on the opposite side for a custom look. Barriers are constructed of steel tubes with polyester covers that are tailor made for a snug fit. Simply stand up the frame and install the cover. Partitions can link together, or stand independently.